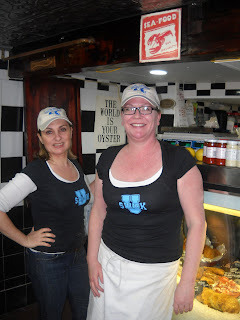 The oyster shucking lessons conducted by Liz and Kari at the Mercato del Mare on Salem Street on the North End were great fun. 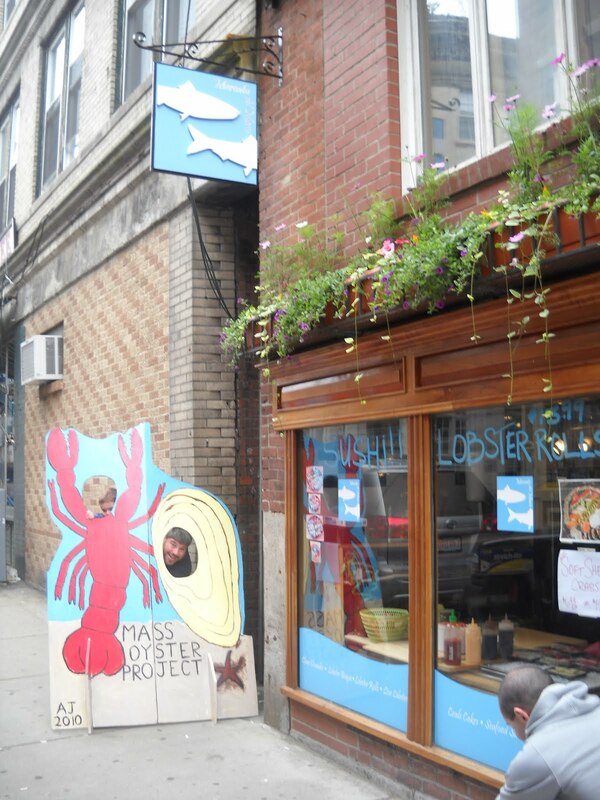 The store is an efficient use of space with a great selection of fresh seafood despite its small footprint. 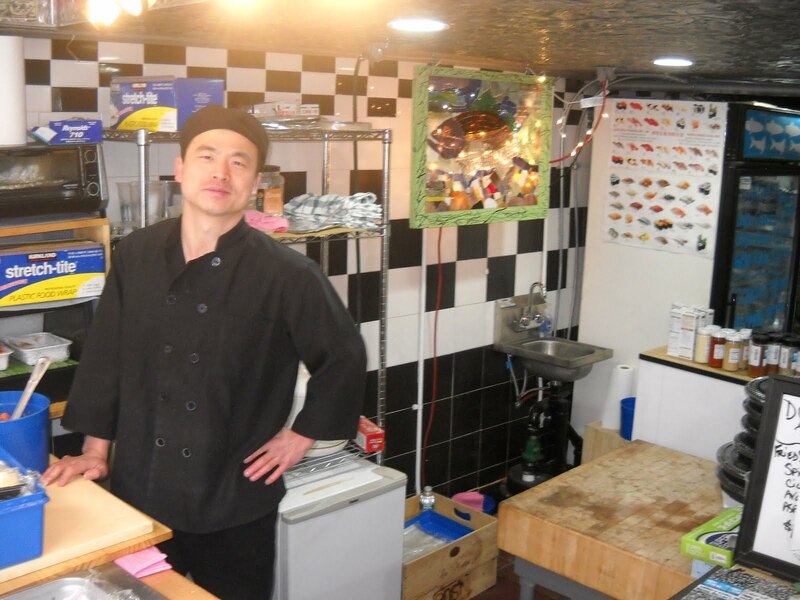 Fresh made sushi in the front window drew a steady stream of foot traffic. 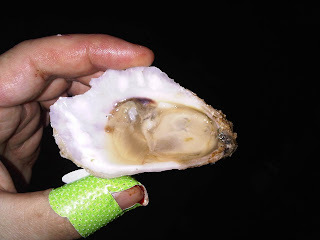 Liz talked us through the parts of an oyster and the points of attack. Leverage is important as you go after the hinge with your shucking knife. Despite their best efforts to protect us from ourselves there were one or two nicked fingers. One of the highlights of the day was the appearance of Boston Bruin Dennis Siedenberg who stopped in for some sushi. He graciously posed for photos with MOP supporters donning a MOP baseball cap as shown below. His likable presence supported the widely held axiom that hockey players are the most approachable class of professional athlete. Let's hope he stops into visit Po, Keri and Liz as a Stanley Cup winner in a couple of weeks. If you missed the event, Kari and Liz host shucking classes every Saturday afternoon from 1-3. At the end of the day, we all had the technique down. 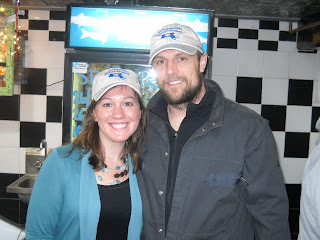 Not only does the aquatic duo look great in Mass Oyster Project baseball caps, but also they are nice, fun people. The sushi here is incredible. Po produced some excellent product for us.